LANSING, Mich.—The Greater Lansing Sports Authority (GLSA) and the Capital City Crushers Women’s Disc Golf Club are pleased to announce that the Professional Disc Golf Association (PDGA) has selected Greater Lansing, Michigan as a site for the 2018 PDGA United States Women’s Disc Golf Championships. Slated for September 20-23 the event will be held at Burchfield Park in Holt and will welcome 70-125 athletes from across the nation for three days of top competition. PDGA research supports Downes’ remarks. The PDGA will have over 3,100 sanctioned events this year and just five-years-ago they topped out at 1,500 events across the nation. 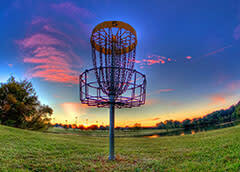 The PDGA is the international governing body for disc golf and is the largest organization for disc golf in the world. The PDGA is a member governed 501(c)(4) non-profit association based in Appling, Georgia. Founded in 1976, the PDGA is made up of more than 90,000 members who live and play in 29 countries worldwide. Each year the PDGA sanctions over 3,100 competitive events for professional and amateur players. For more information visit www.pdga.com.